When you think about safety features on your vehicle, you probably think of the seatbelts or different types of airbags that a vehicle offers. However, no matter what type of car you have or what year it is, one of the most important safety features for any vehicle is actually something every car has: tires. Tires create the traction you need to stop quickly. Without this traction, you’re looking at unnecessary safety risks. We have come up with a few different ways for you to determine when you need some new tires. The penny test. This test requires no special equipment or tire expertise. Take a penny, and insert Lincoln’s head into the tread of your tires. If the tread covers his eyes and nose, then they are good to go. If they are above that line, they are getting worn and need replacement. Simple as that! Visual inspections. Do your tires look bald? Are they fraying anywhere? Do any of your tires have bulges or other odd spots? These are all warning signs that the rubber of your tires might be breaking down, putting you at risk for blowouts or other problems with your tires. Frequent use of spare tire. If you find yourself pulling out your spare on a somewhat frequent basis, check out your tires! A spare tire is only meant to get you home or to the mechanics for replacement, not for long-term use. If you are getting that spare out often, your tires need to be replaced. 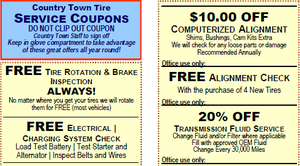 For more information about your tires, come see us here at Country Town Tire & Auto Service Center for an expert opinion.